Pectin is a type of fiber that is found in all plant cell walls and tissues. While all may contain pectin, the amount and concentration of pectin varies among plants. Apples contain a particularly high amount of pectin, according to dietaryfiberfood.com, and the highly concentrated apple pectin delivers many health benefits. Apple pectin is available in the skin and pulp of fresh apples or as a dietary supplement. Soluble fiber is fiber that can disperse or spread in water. For example, if you leave oatmeal, a good source of soluble fiber, in water too long, you will see a gel type substance form in the water. Apple pectin is a rich source of soluble fiber, which plays an important role in the prevention and treatment of disease. The American Heart Association reports that adding soluble fiber to your diet will reduce your risk of heart disease and can reduce your bad cholesterol levels more than following a low-fat diet alone can. Soluble fiber works to lower cholesterol by reducing the amount of it that is absorbed in the intestines, according to the National Institutes of Health. Metabolic syndrome is a term that is given to a group of risk factors that contribute to heart disease, stroke and high blood sugar. Risk factors, listed by the National Heart, Lung and Blood Institute, are high blood pressure, high blood sugar, high triglycerides, high cholesterol levels and a large waist circumference. A study in the May 2008 issue of the "Journal of Agricultural and Food Chemistry," found that rats that were fed apple pectin experienced a reduction in blood sugar levels, total cholesterol levels, triglyceride levels and weight. A reduction in one or all of these factors will contribute to a reduction in high blood pressure as well. Researchers call the difference in the pectin groups cholesterol profile "remarkable" and suggests that apple pectin may one day be considered as a treatment for metabolic syndrome. A healthy intestinal tract contains both good and bad bacteria, with the optimal situation being where the good bacteria far outnumber the bad. The job of intestinal bacteria is to help us digest food, absorb nutrients and keep viruses and bad bacteria in check. The March 19, 2010, issue of "Anaerobe" reports that increasing apple intake improves the intestinal environment and that it is the apple pectin in particular that helps do the job. 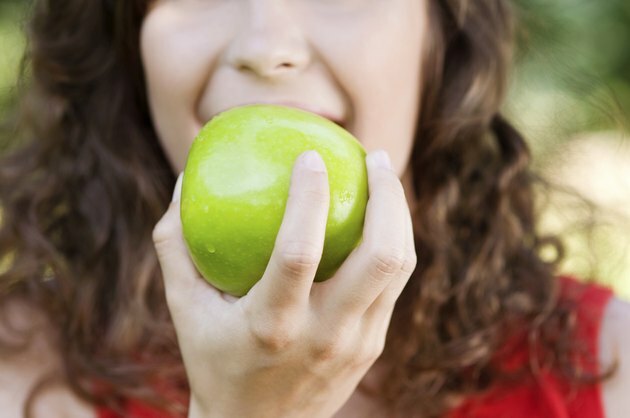 Is Apple Peel Good for You?